The Winter 2011 dineLA Restaurant Week list of participants is now live, with nearly 300 restaurants throughout Los Angeles County offering specially-priced three-course lunches and dinners. Now in its sixth season, the Winter edition of the bi-annual dining event will take place from January 23-28 and January 30-February 4, 2011. dineLA is an initiative created by LA INC. and American Express to showcase Los Angeles as a premier dining destination, and offers diners a chance to sample from some of the city’s top restaurants. For this edition, dineLA welcomes newcomers Beechwood (with Top Chef All-Star Jamie Lauren), the iconic Inn of the Seventh Ray, and after many dineLA fan requests, The Hungry Cat. In addition to The Hungry Cat, some of L.A.’s finest cocktail destinations are returning as dineLA participants, including Bar | Kitchen, The Bazaar, Comme Ça, Drago Centro, First & Hope and The Raymond (1886). dineLA Restaurant Week offers three dining categories (Deluxe, Premier, and Fine Dining) with specially-priced prix fixe meals for lunch and dinner. Diners can choose from three options for each course, including appetizer, entrée, and dessert. American Express Cardmembers will be able to register any eligible American Express Card to receive a $20 statement credit when they dine three or more times during dineLA Restaurant Week at participating restaurants. dineLA’s Hotel Program is being offered again this year, which allows hotel properties with participating restaurants to offer special dineLA rates and culinary packages. 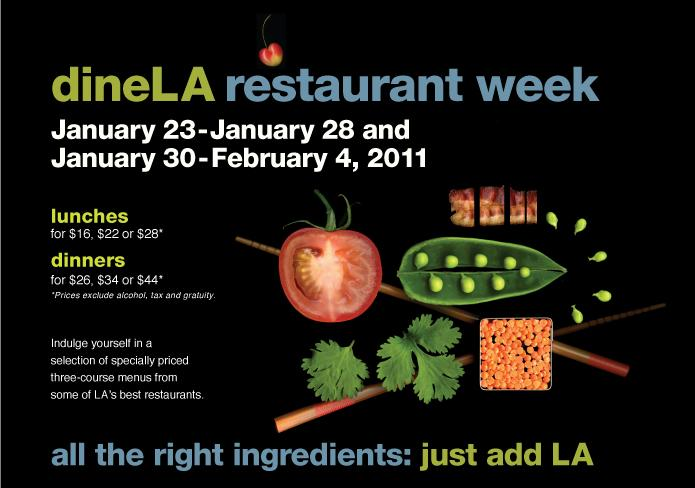 For more information, visit: dineLA.com/RestaurantWeek. dineLA is partnering with Acura and The San Francisco Convention & Visitors Bureau for the “Eat Your Way From SF 2 LA” sweepstakes. One lucky winner and a guest will win a culinary road trip that takes place from Jan. 27th to Feb. 1st. The tour begins in San Francisco, travels down the West Coast, and culminates in a two-day, food-filled stay in Los Angeles during the Winter 2011 dineLA Restaurant Week. The chariot for this journey will be the all-new Acura TSX Sport Wagon. Entry and contest details are available at the official dineLA website.